Welcome to the Close to my Heart Stamp of the Month Blog Hop! We will be featuring August's totally awesome Stamp of the Month called "Wicked". If you have come here from Debra's blog, you are on the right path! This is a circular hop so to see all 60+ participating sites, just click on the link at the end of each post to keep hopping along! When I pulled this set out of the box I just fell in love with the incredibly funky images and how the stamps themselves were laid out on the carrier sheet. That puzzle block layout plus an awesome layout using Mischief in the new Idea Book inspired this piece. This is part of my new home decor series which is a 12x12 scrapbook frame display in my front room dedicated to seasonal / holiday layouts. I started this piece prior to my new papers arriving so wasn't able to use the new Mischief papers (which I adore) so I used the colors from those papers instead. 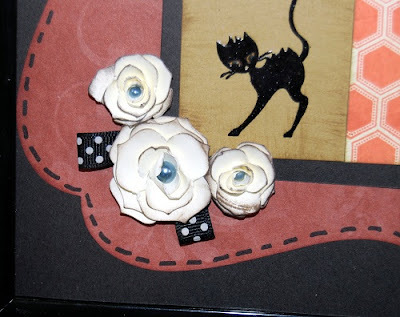 After my order arrived on Friday I was able to use our new Cricut cartridge (OMG that thing is cool) to make the Colonial White roses that accent the corners of the frame. Here is a close up of the center square to see the puzzle layout better if you'd like to make a copy for yourself. You can see I used a little watercolor pencil on the witch to color her arms and legs in Gray Wool and under her hat in Orange to coordinate with the papers and jazz up her up. Now head on over to Katy's blog and see what she's created for you with this fun and funky stamp set! If you'd like to get a little "Wicked" then head on over to my website at Paige.MyCTMH.com prior to August 31st to pick up this set! You can purchase it outright for just $17.95 OR you can get it for $5 with any $50 order! Very cute. The details are wonderful. Wow!! 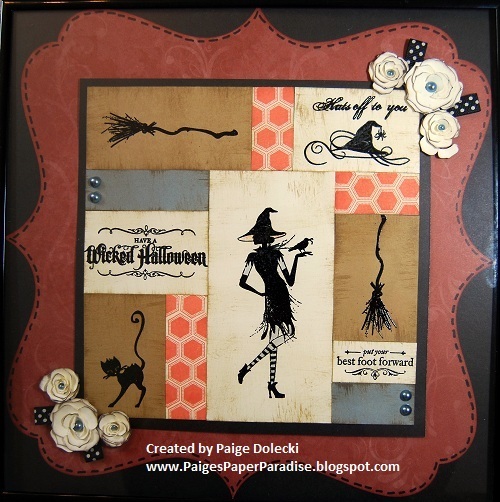 Another beautiful wall-hanging! I really loved the "home decore" piece you shared last month, and you've definitely out-done yourself again this time - so stunning!! THANKS for inspiring me with your creativity!! I love this home decor item :) I think I may have to do something like this! LOVE your home decor project! I have a 12"x12" frame just by my front door, too! Now you've given me inspiration! :) Thank you! WICKED project! 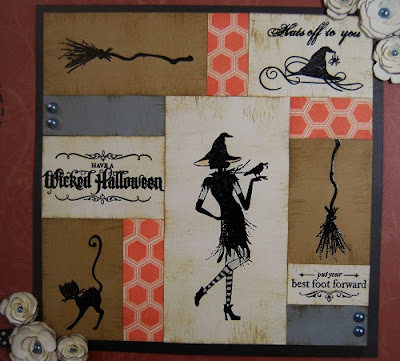 I like the patchwork pieces and how you incorporated the stamp set into the design. LOVE IT!!! wink can I scraplift it? Nice work! Love those flowers. Great Job! Love the idea! Totally love this display...It combines all I love about this set and this paper! Great minds think alike- just alittle differently! What a fabulous layout (just getting thru hop...)!! Beautifully done! !